Construction is ready to begin on the new Government Services Center (GSC) North in Virginia. Representatives from St. Louis County, the Quad Cities, key contractors involved in the project and other community partners all took part in a groundbreaking Thursday to celebrate the start of this $19 million building project. Once complete, the GSC North will be a two-story, 63,000 square foot facility, and will serve as a centralized hub for people in Virginia and surrounding areas to access county services from more than 10 departments in one place. Approximately 180 employees will work in the building. "This is an exciting day for Virginia, the surrounding communities and all of St. Louis County," said County Board Chair Keith Nelson. "This new building will help us better serve our citizens by making it easier for them to access our staff. Plus, the design of the building will enable our staff to work together more efficiently across departments." Added Virginia Mayor Larry Cuffe, "The Government Services building will provide critical and consolidated operational services to the Iron Range communities. It will serve as a centralized hub in the heart of Virginia. The commitment by St Louis County will professionally serve our communities for years to come. DSGW Architects drew inspiration from the Iron Range community, culture, and history in developing the design of the new building. Materials to be used include locally sourced stone, native wood species, steel panels and details reminiscent of the region's mining heritage and future. The work of local artists is also being incorporated into the architecture of the building, landscape, and site. Max Gray Construction of Hibbing will serve as contractor for the project. "This is our biggest project to date and we're excited to start digging," said Mike Carlson, project manager for Max Gray. "I've been around the Iron Range my entire life and it's always great to work here. The process has been fun. It's a great team that's worked together well." Construction on the the GSC North is expected to be complete by the fall of 2019. It will replace the aging Northland Office Building. 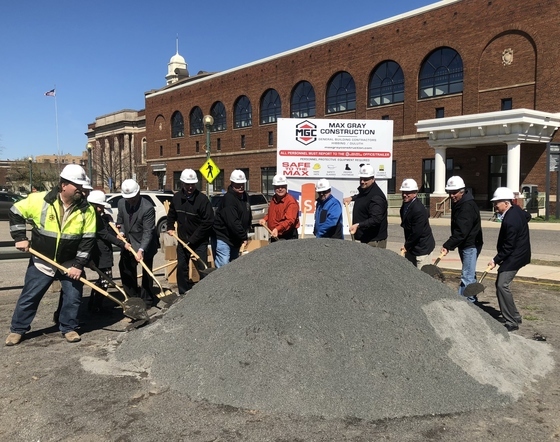 County and city leaders, along wtih key project partners, dig into a pile of taconite tailings to celebrate the beginning of construction of the new Government Services Center North building in Virginia. 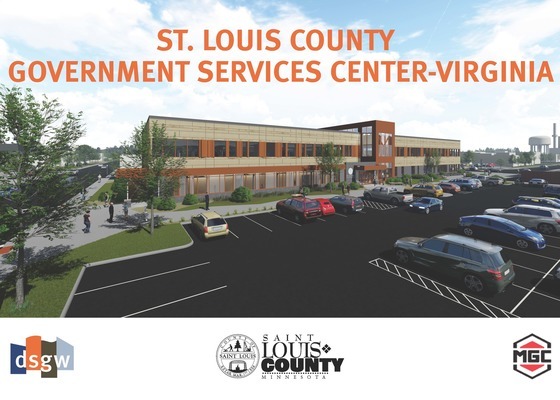 An artist's rendering shows what the completed Government Services Center - North will look like once complete.